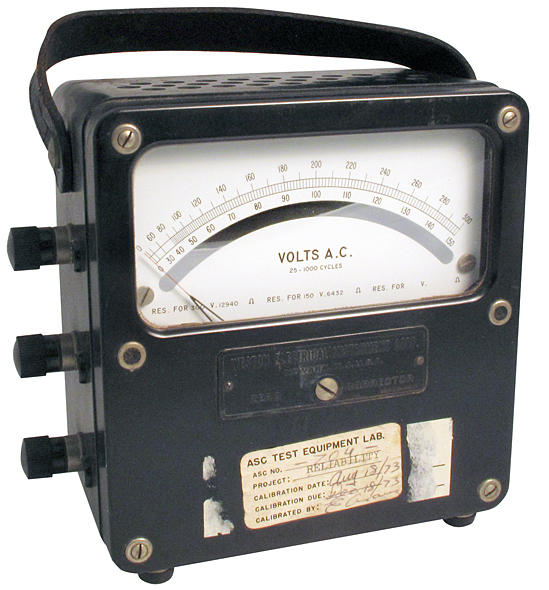 A&M Instruments voltmeter. Sealed. 0 - 3v AC. 3-1/2" diameter face. Requires 2-3/4" diameter hole. 2-1/4" behind panel depth. NSN: 6625-00-116-7368. 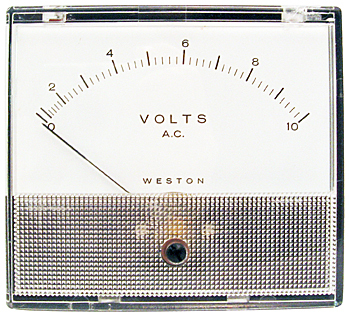 Weston panel meter. Model 1944. 0 - 10v AC. 25 - 125 Hz. 4" x 4-7/16" x 1-7/8" behind panel depth. Requires 2-3/4" diameter hole. Harris P/N: 630-0138-000. 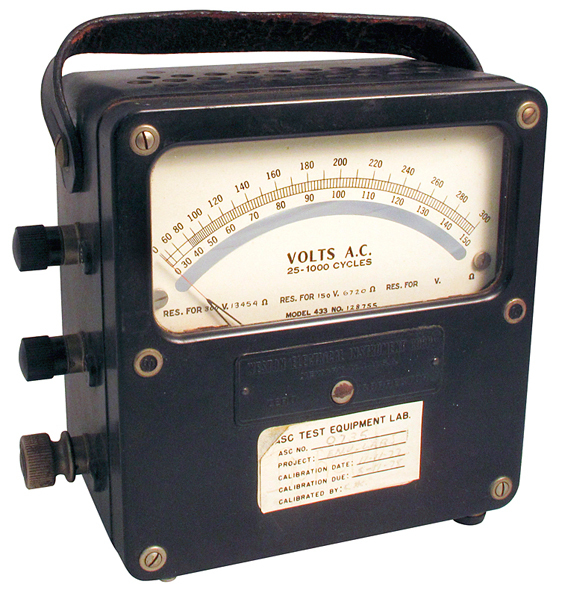 Weston lab meter, AC volts. 25 - 1000 cycles. Side terminals, leather case. 0 - 15v, 62.7 ohms internal. 0 - 30v, 125.5 ohms internal. 3-1/4" x 5" x 5-1/4"H. Only one available. 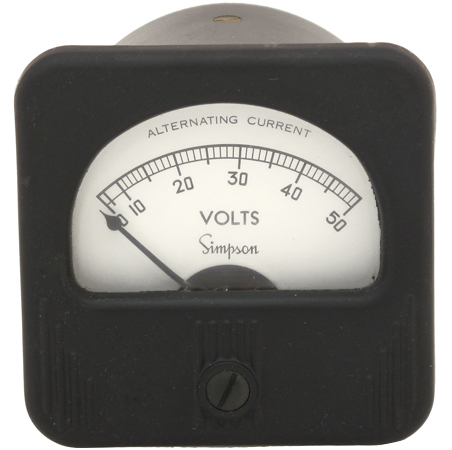 Simpson 0 - 15v AC meter. Model 57. Movement, panel mount. 3" wide x 3-1/8" high. Fits 2-3/4" diameter hole. 2-1/4" behind panel depth. 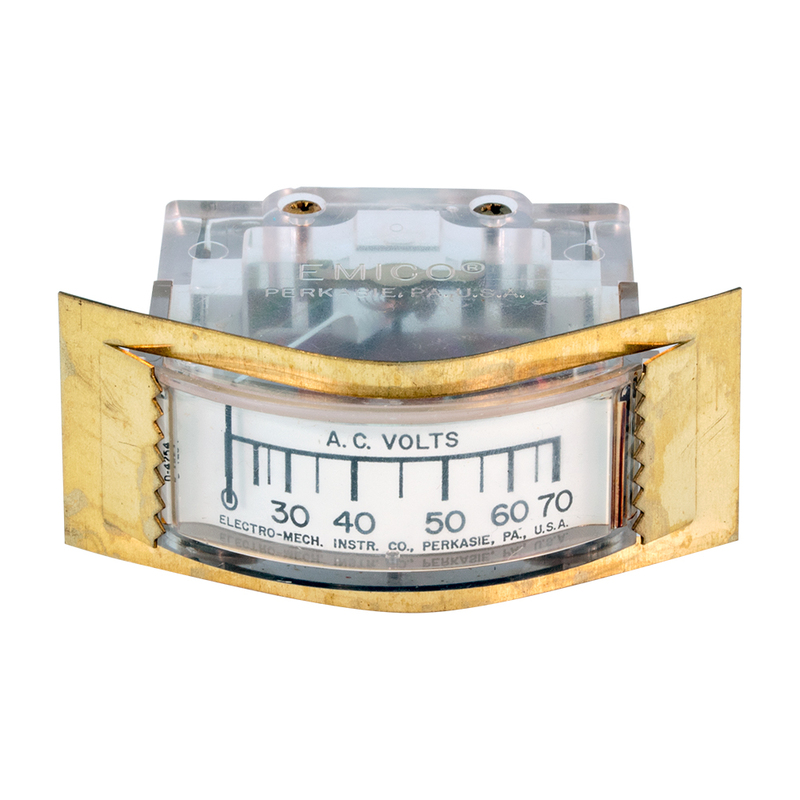 Central Electronics sealed voltmeter. 20 volts AC scale. 3-3/8" x 3-3/4", 2-5/8" mounting hole, 1-5/8" behind panel. 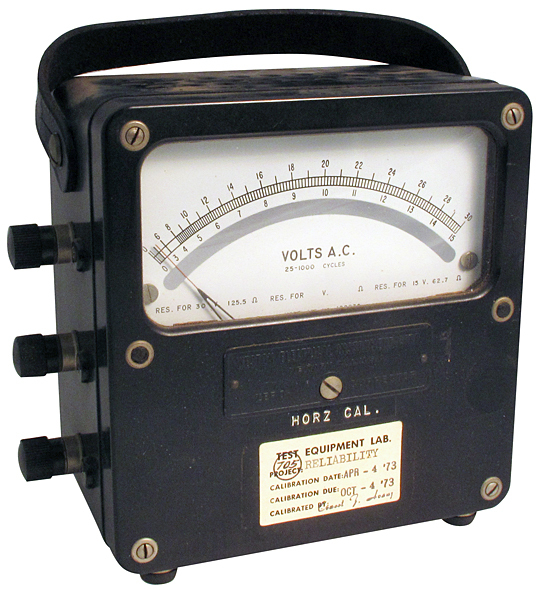 Weston lab meter, AC volts. 0 - 15 - 30 scale. Side terminals. Leather strap. Black bakelite case. 0 - 15v AC, 161.9 ohms internal. 0 - 30v AC, 324.6 ohms internal. 3-1/4" x 5" x 5-1/4"H. Only one available. A&M sealed, ruggedized direct reading meter. 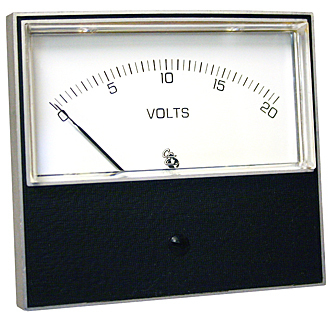 0 - 50v AC scale. 2-5/8" diameter face. Fits 2-1/8" hole. 2-1/4" behind panel. Simpson 0 - 50v AC meter movement including hardware. Model 157. Panel mount. 2-3/8" wide x 2-3/8" high overall. Fits 2-3/16" hole. 2" depth behind panel. Emico (Electro Mechanical Inst. 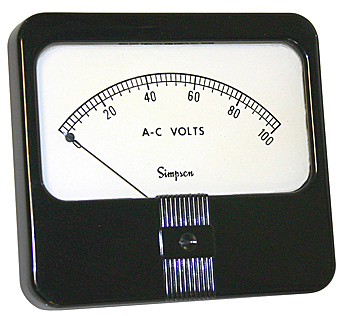 Co.) panel meter. 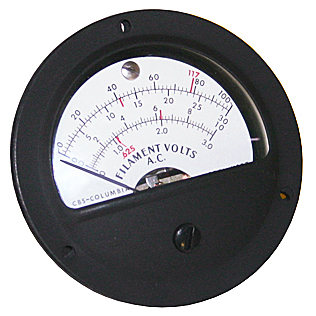 0 - 70v AC. 0.755"H x 1.83"W x 1.67" depth. Includes retainer clip. Made in the USA. Simpson good ol' fashioned 4" direct reading meter. 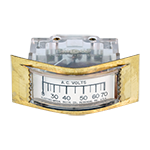 0 - 100v AC scale. 4-1/4" x 4-5/8" face. Fits 2-3/4" hole. 1-3/4" behind panel depth. 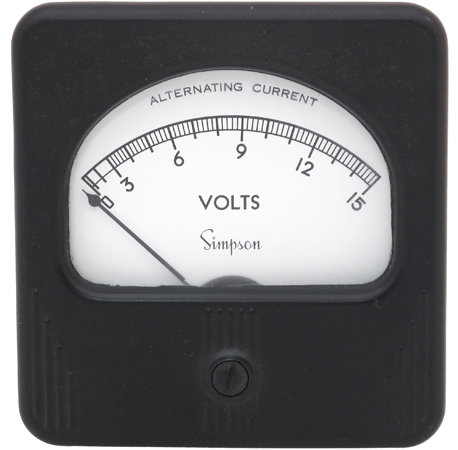 Phaostron sealed meter has full scale deflection of 100 µa. 50 - 440 CPS. 3-1/2" diameter face. Fits 2-5/8" hole. 2" behind panel depth. 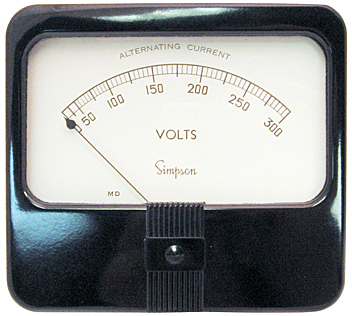 Simpson panel meter. Model 59. Direct reading. 0 - 300v AC. 4-1/4" x 4-3/4" x 1-7/8" deep. 3-1/2" x 4" c-c mounting studs. Requires 2-3/4" hole. Harris P/N: 630-0048-000. Yokogawa large scale panel meter. 0 - 300v AC. 4-5/8" wide, 4-1/8" high face. Fits 2-5/8" hole. 1-7/8" deep. 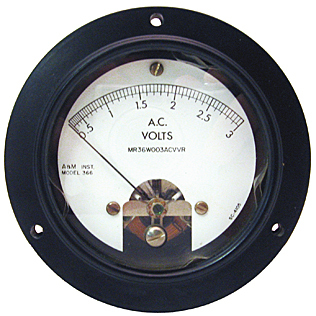 Sealed AC volt meter with "0 - 3/10/30 and 100" scales. Actual fs = 1.5v. 2-3/4" diameter face. Fits 2-3/16" hole. 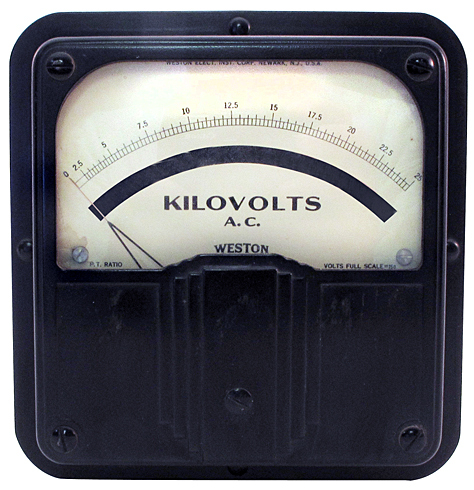 Weston lab meter, AC volts. 25 - 1000 cycles. 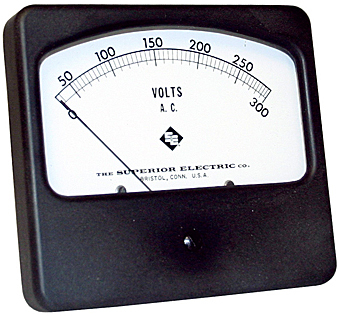 0 - 150 - 300v AC scale. Side terminals. Leather strap. Black bakelite case. 0 - 150v, 6,432 ohms internal. 0 - 300v, 12,940 ohms internal. 3-1/4" x 5" x 5-1/4"H. Only one available. 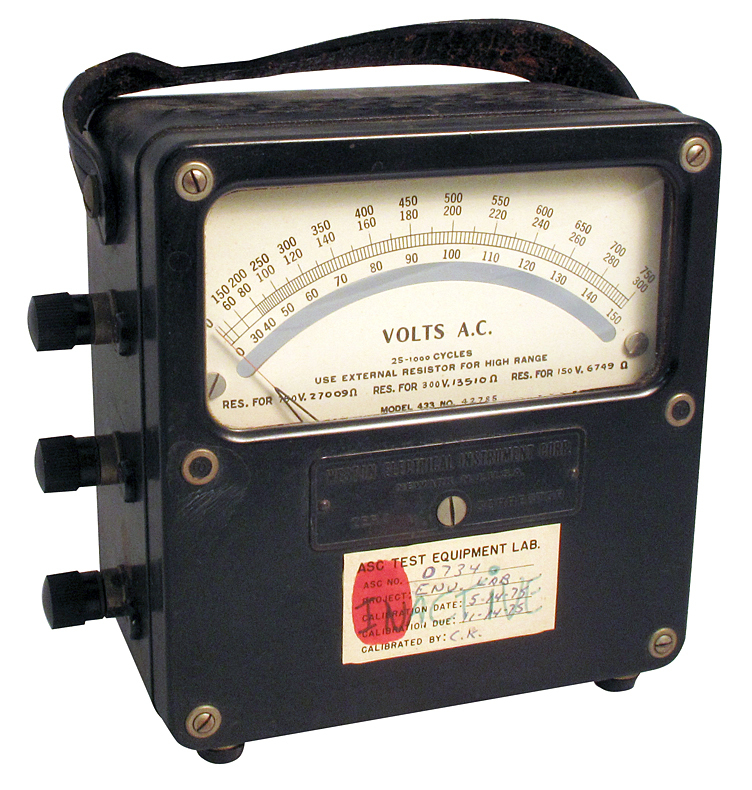 Weston lab meter, AC volts. 25 - 1000 cycles. 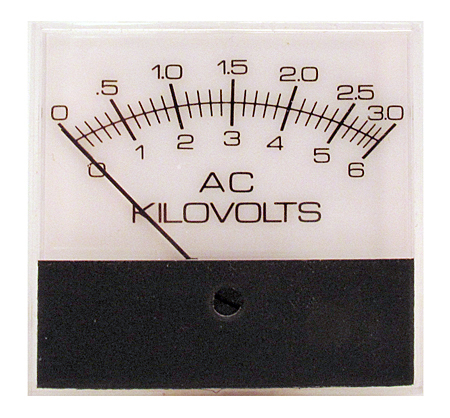 0 - 150 - 300v AC scale. Side terminals. Leather strap. Black bakelite case. 0 - 150v, 6,720 ohms internal. 0 - 300v, 13,454 ohms internal. 3-1/4" x 5" x 5-1/4"H. Only one available. 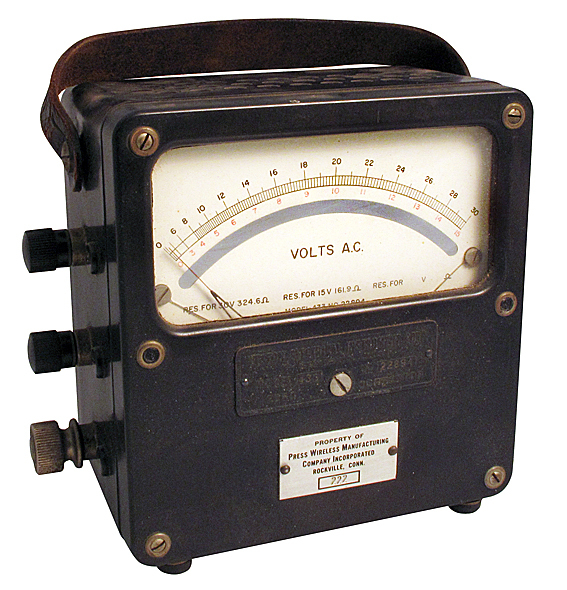 Weston lab meter, AC volts. 25 - 1000 cycles. Use external resistor for high range, 750v (not included). Side terminals. Leather strap. Black bakelite case. 0 - 150v, 6,749 ohms internal. 0 - 300v, 13,510 ohms internal. 0 - 750v, 27,009 ohms internal. 3-1/4" x 5" x 5-1/4"H. Only one available. Vintage Weston panel meter. 0 - 25 kv AC. FS = 150v AC. Requires 5-7/8" square hole. 6-5/8" x 6-5/8" x 5-5/8" deep. Made in the 1930s. Only one available. Modutec meters originally used together. 2-3/8" square. 0 - 3 kv AC and 0 - 6 kv AC. Actual fs = 1 madc. Surface mount. Matches 0 - 40 ma meter (MTR) 920062.